Would you like to see my chainsaw collection? It turned out rather longer than expected – and that was knowing we had multiple trips to make! This morning, we headed out to pick up a snow blower (yay!) from the place my brother bought our riding mower from, in a fairly large town about 2/3s of the way to the city. 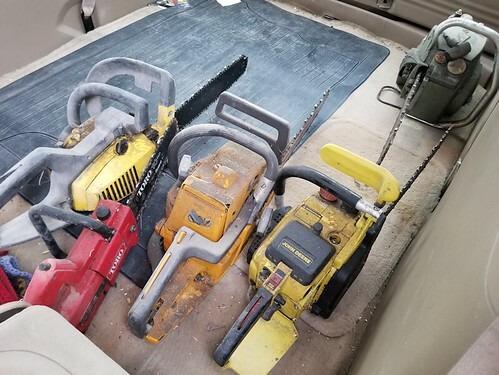 Since we were going to a small engine place, I remembered to bring the chainsaw collection in the garage, to see if any of them are salvageable. In the process, I found another chain saw! I had noticed before that there was something red under one of the yellow chainsaws, but we haven’t done much at all to clean up the garage, yet – no more than absolutely necessary, until other, higher priority stuff, gets done. Once I took off the chain saw on top and could see more of it, it reminded me of the electric chain saw we got that now screams when I try to use it (I still have to remember to call the company number about that! It has a 2 yr warranty, so I should be able to get it taken care of). Sure enough, when I pulled it out, it was a small, electric chain saw. The big one in the back (top right in the photo), I brought just for show and tell. That one is probably 60+ years old, and weighs about as much as the other three, all together! When I brought it into the shop and the owner saw it, his first reaction was WOW! Though he’d worked with some of the original chain saws, in his younger days, I think this one turned out to be even older than he expected. As for the newer ones, I’ve told them to pick the one that looks the most fixable, but that there is no hurry. I won’t need it until spring, and won’t have the budget for a repair until next month, so they can take their time over them. Then we loaded up the snow blower. Funny thing is, people keep thinking large items won’t fit in the back of our van. My brother was thinking I’d have to remove the middle seats (we left behind the bench seat when we moved). Even the shop owner took a look and wasn’t sure it would fit. Just look at that beast!! We had a piece of 3/4 inch plywood I thought could be used as a ramp, but in the end, it was easier to just lift it. One person in the van to tip the blower and push it forward, two of us to manhandle it over the lip around the door, then get it to the ground. There is the Beast, safe at home! When I told the girls this, they both burst out laughing. I can understand why he would think that; I’m a short, fat, middle aged woman. People just don’t expect me to be muscular, too! 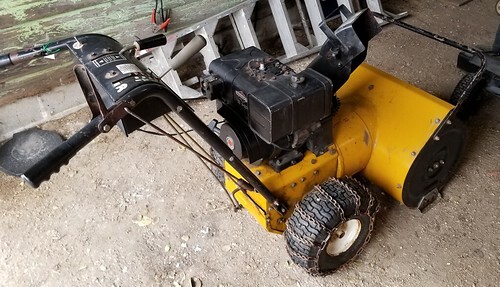 I don’t know where this snow blower came from. In fact, other than photos my brother sent me, I’ve never seen it before today. He took it from the farm before my older daughter and I arrived. He repaired as much as he could himself over the summer, then took it to the shop for the stuff that would be much easier for them to do. According to the itemized receipt, it took only 2 hours to do the work; it would have taken my brother all day. The right space and equipment makes a huge difference!! My brother doesn’t know where it came from, either, other than our late brother probably salvaged it from somewhere. The shop owner commented on what looked like fire damage on it. I don’t know how long it was sitting, but the fuel tank was full of rust, as were other parts. He also showed me a similar sized new one he had in the shop for comparison. This Beast has a more powerful engine, larger impeller, and the augers are steel instead of sheet metal. The new snowblower he was showing me sells for about $1300, while getting this one fixed cost me just over $250. Though that doesn’t count the work my brother did, it still is a lot less than buying a new one! This thing is an absolute tank, and will go through snow like nothing. The shop owner was able to tell me all sorts of things to expect while using it, because he has one just like it that he uses for his own home! This beast will be able to handle our needs much better than a modern one would, that’s for sure. So we are now prepared for the winter’s snow! Once we finished offloading the snow blower, the girls and I all headed off again, this time to the city for our Costco shopping. Since the one we go to is relatively close to my older brother’s place, we ended up visiting him briefly, first. By the time we left for the city, though, it had started to snow a bit, and the winds picked up, so the visibility started dropping. It still wasn’t too bad when we got to my brother’s, but it kept getting worse, so we headed out quicker than I would have preferred, to do the shopping (including picking up a jerry can of fuel for the snow blower). It was actually a smaller Costco shop than our usual big monthly shop, as we will be making another one, closer to Christmas. Which was a good thing, because that meant we got out faster. By then, the roads were getting pretty slick, and it was already full dark. Even the speedsters were driving below the speed limit as they passed us, and very few people passed us! We were doing anywhere from 20-30km/h below the speed limit, the whole way. We were certainly glad to get home! 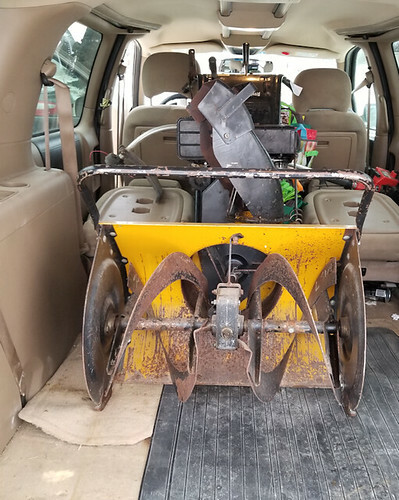 After we unloaded the van, one of the girls did some light shoveling; tomorrow, in daylight, I want to test out the electric snow shovel that was found in the garage. I know it runs; I just don’t know how well it works. I’ve never seen anything like it before, but apparently my dad was able to use it for some time before his mobility decreased too much. I’m kind of glad that, even though most of the working and useful stuff that was here at the farm disappeared before we moved in, there are still some things around that can be used or repaired.